Startup Meldium now has $1 million in seed funding to help ease password-management headaches for businesses. And that’s no easy task. Speaking from experience, I have about four or five outside accounts — for photos, for site tracking, etc., for work as well as personal Twitter, Facebook (s fb) and other accounts — and I probably use fewer apps than most of my colleagues. Worse, all those passwords are not-so-securely stashed on Post-it notes and/or a spreadsheet. That’s a problem, especially for younger companies that grew up on web applications like GitHub, Box, Asana and Dropbox. For older companies nurtured on client-server applications, passwords and access rules typically sit on a single server — a mode that does not work so well now. “We aggregate all that — all the user and account data via API connections to those services,” in an access-management layer, co-founder Boris Jabes said in an interview. “We see people just love using more apps, but that gets more and more confusing. It’s not just about the passwords but who has access to what,” said Jabes, who spent seven years at Microsoft’s (s msft) tools group. His co-founders Anton Vaynshtok and Bradley Buda are both Amazon(s amzn) alums. Meldium, which was founded in Seattle but is now in San Francisco, lets department managers grant access to a given app to an intern or freelancer with the click of a button, but without sharing the underlying password. That has obvious ramifications for security. 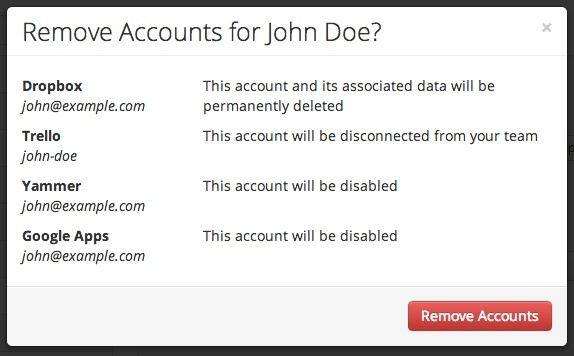 And, when an employee leaves the company, the admin can just disable or delete her corporate accounts without touching her personal accounts. The service was in beta till March, and the company then started charging. About 10 percent of 800 companies using the service pay to do so, Jabes said. Meldium has a free offering for small teams. The company competes with Okta and Microsoft in some respects, but Jabes maintains its cloud-first design better suits it for startups and growing younger companies. Investors including Draper Associates and Founders Co-op provided the seed funding. Meldium was also part of last winter’s Y Combinator class. OneLogin has account management capabilities for lots of different apps and is implementing lots of new API’s for account management it seems regularly. GitHub and Asana are important apps, I wonder if they have already built those into okta and onelogin? Still adding new app connections cant be too difficult and the longer the companies been around the more they will have already seen and added. Meldium is a huge help for us at Buffer. We use countless amazing 3rd party apps and services to help us run the company, and before Meldium it was a long process to onboard new team members, and if someone left we had a hassle where everyone knew passwords to our Twitter account and various other places. We quickly started paying for Meldium, it simply solves a huge and real pain we had. Hi Jim, Boris from Meldium here. We’re definitely solving the same kind of pain (dealing with passwords) although in practice there are a couple of key differences between our products. The first is that when users share access to apps with Meldium, you can guarantee that other users can’t see the password. The second is that we’ve focused on providing account management automation over a new breed of apps like GitHub & Asana, which eschew traditional corporate identity management approaches. We talk about this a little more on our blog (blog.meldium.com).